This is a scalable context timeline. It contains events related to the event (September 12-21, 2001): Recovery Workers Search for One of the Black Boxes at Ground Zero in Locations Where Its Signal Has Been Detected. You can narrow or broaden the context of this timeline by adjusting the zoom level. The lower the scale, the more relevant the items on average will be, while the higher the scale, the less relevant the items, on average, will be. Steven Stefanakos. [Source: New York City Police Department. ]Recovery workers at Ground Zero search for one of the black boxes from Flight 11 or Flight 175—the planes that crashed into the World Trade Center on 9/11—in locations where a signal from the device has reportedly been picked up, but it is unclear if they find a black box. [Appel, 2009, pp. 281-282] The two “black boxes” carried by all commercial aircraft—the cockpit voice recorder and the flight data recorder—can provide valuable information about why a plane crashed. [CBS News, 2/25/2002; PBS, 2/17/2004] In the week after the 9/11 attacks occur, investigators identify a signal being emitted by one of the black boxes in the WTC debris, according to a report published by the New York State Emergency Management Office (see September 18, 2001). [New York State Emergency Management Office, 9/18/2001, pp. 1 ] The signal is detected by the Federal Aviation Administration (FAA), according to author Anthea Appel. However, while FAA personnel are able to hear the signal, they are unable to pinpoint exactly where it is coming from. FAA Suggests Two Possible Locations for the Black Box - The FAA initially says it thinks the signal is coming from the corner of Liberty and Church Streets, which border the south and east edges of the WTC site, respectively, and so recovery workers are sent to dig at this location. However, after a few days, it changes its mind and, on September 21, says the signal is coming from Building 5 of the WTC. [Appel, 2009, pp. 281] This nine-story building is located in the northeast corner of the WTC site. [Federal Emergency Management Agency, 5/1/2002, pp. 4-1] The signal is coming from inside or directly under its roof, the FAA says. Police Officers See No Sign of the Black Box - Lieutenant Delia Mannix of the New York Police Department’s Emergency Service Unit (ESU), who is in charge of the operation to recover the black box, decides the only way to search the roof of Building 5 is to send a team up in a small, waist-high cage known as a “bucket.” Steven Stefanakos and two other ESU officers, who are selected for the task, get into a bucket and a crane lifts them onto the roof of Building 5. Knowing the black box is supposed to be under or embedded in the roof, Stefanakos and the two other officers look around, trying to spot a hole or a dent where the black box could have punctured the roof after being catapulted out of the plane when it crashed into the WTC. The roof, however, appears to be intact. Pier 25 on the Hudson River. 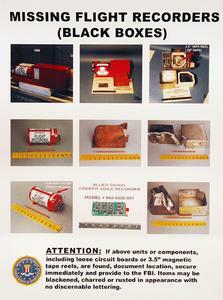 [Source: Larry Lerner / FEMA]Recovery workers find what appears to be one of the black boxes from Flight 11 or Flight 175—the planes that crashed into the World Trade Center on 9/11—while they are working near Ground Zero, but FBI agents who inspect the object deny that it is one of these devices. [Keegan and Davis, 2006, pp. 94-96] The two black boxes carried by all commercial aircraft—the cockpit voice recorder and the flight data recorder—can provide valuable information about why a plane crashed. Although they are called “black” boxes, they are in fact painted bright orange. [CBS News, 2/25/2002; PBS, 2/17/2004] Since the initial days of the recovery effort at Ground Zero, finding the black boxes from Flight 11 and Flight 175 has been a priority, due to the critical information they might hold. Many posters with photos of a plane’s black boxes have been put up around the WTC site so workers will recognize these devices if they turn up in the debris. Operating Engineer Thinks He Has Found a Black Box - Today, an operating engineer notices an object that looks like it could be one of the black boxes while he is scraping up a load of debris at Pier 25 on the Hudson River. [Keegan and Davis, 2006, pp. 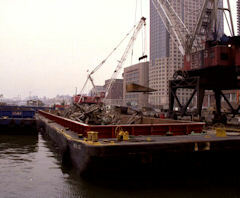 94] At Pier 25, near Ground Zero, debris from the WTC site is being loaded onto barges and transported to the Fresh Kills landfill on Staten Island. [New York Daily News, 1/6/2002; APWA Reporter, 3/2004] The operating engineer thinks the object is the same shape as a black box. It is too blackened and charred, though, for him to determine if it is painted orange, like a plane’s black boxes are. He stops operations at the pier so he can get the opinion of the crane operator there. The crane operator agrees that the object looks like a plane’s black box and says its discovery should be reported. The operating engineer therefore makes a call to report the find and is put through to Lieutenant Ed Moss of the Port Authority Police Department (PAPD). Police Officers Think the Unearthed Object Is a Black Box - After the operating engineer tells him about the discovery, Moss heads to Pier 25 with his colleague, Lieutenant Bill Doubrawski. He examines the object and he too thinks it is one of the black boxes. Excitedly, he contacts Lieutenant William Keegan, who is in charge of the PAPD’s nighttime rescue and recovery operation at Ground Zero. Talking over a secure phone line, Moss tells Keegan: “I think we found one of these things. I’m looking at the diagram. I think this is it.” Moss says Doubrawski agrees with his assessment. He describes the object as being “[h]ard as a rock, not orange,” and looking “like it was torched, all blackened.” Keegan says he wants to see the object and heads to Pier 25 to examine it. Senior Police Officer Agrees with His Colleagues' Assessment - When he arrives there, he compares the object to some photos of a plane’s black boxes and agrees that it appears to be one of these devices. “The object found on the pier was absolutely close enough to the pictures available to us to notify the FBI without delay,” Keegan will later write. The PAPD officers arrange for some FBI agents who are working at Ground Zero to come to the PAPD command post to see the object.